Ford to truck fans: "You're welcome!" It’s the full-size pickup truck and it’s finally here. 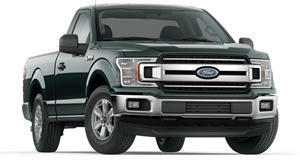 Ford has unveiled its all-new diesel-powered F-150 with an EPA-estimated range of 30 mpg highway. Power comes from a new 3.0-liter Power Stroke turbo diesel V6 with 250 hp and 440 lb-ft of torque. Peak torque comes in at 1,750 rpm. Ford also claims best-in-class towing capacity of 11,400 pounds and 2,020 pounds of payload capacity. This is the sixth engine offered in the F-150 lineup. Ford says it features the same compacted-graphite iron block material construction and forged-steel crank found in the 2.7-liter EcoBoost. These materials allow for added strength and durability while also reducing overall weight. To help combat turbo lag and increase responsiveness, engineers went with a high-efficiency variable-geometry turbocharger and a common-rail fuel injection system. The sole gearbox is a 10-speed automatic and two- and four-wheel drive will be offered. “For every truck owner who wants strong fuel economy while they tow and haul, we offer a new 3.0-liter Power Stroke V6 engine that dreams are made of,” said Dave Filipe, vice president global powertrain engineering. “The more you tow and the longer you haul, the more you’ll appreciate its class-leading towing and payload capacity and how efficient it is at the pump.” Set to go on sale this spring, the 3.0-liter Power Stroke engine is optional in the Lariant, King Ranch and Platinum Edition SuperCrew trucks with a 5.5- or 6.5-foot bed configuration, and Super Cabs with a 6.5-foot bed. Pricing will also be announced closer to the on sale date.